Before we go any further up the Schloßstrasse in Mülheim, we need to turn left and have a look at the Viktoriaplatz. I showed the old postoffice in a previous posting, but this is the wide view from March 2003 – which now, ten years later, looks somewhat different again. The building on the left used to be the headquarters of the Sparkasse and later was used by the city government, but it was completely torn down in 2009 and replaced with the new Medienhaus now containing the city library. 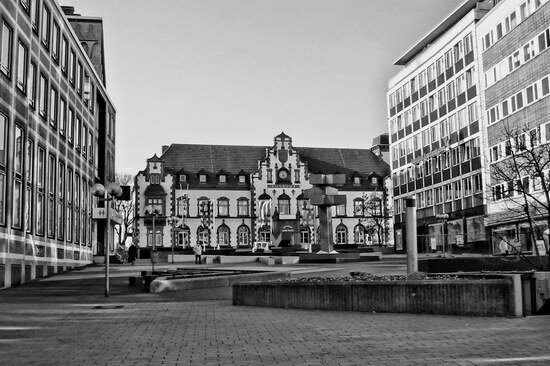 The square is actually now named Synagogenplatz, because there used to be a synagogue, built in 1909 and burnt down in 1938, on the site where later the bank building and now the Medienhaus are located. In front of the old postoffice you can see a kind of metal statue – this belongs to the infamous Hajek Fountain, which was designed by the artist Otto Hajek and was installed in the 1970s. While the fountain is made up of colourful geometric figures which you can even see on the Google Maps satellite images, the statue is just blank metal and looks so ugly that it doesn’t really warrant a closer look.